Sorry... the 2017 Nissan Maxima is no longer being sold as new. Instead, take the first step to a great deal on 2019 Nissan Maxima with a free price quote! 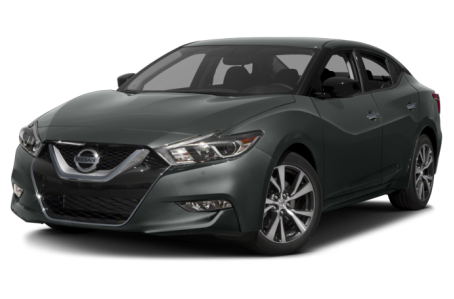 The 2017 Nissan Maxima is a full-size sedan that is part family car, part sports car, and part luxury car. It competes with the Ford Taurus, Toyota Avalon, and Dodge Charger. Five trims are available: the S, SV, SL, SR, and Platinum. Redesigned last year, the Maxima has a dramatic, hyper-aggressive frontend that is bound to turn heads. It has angry, jagged-tooth headlights that join with a bold, double V stacked grille. Black-slit door pillars give the illusion of a floating rooftop. Wavy body lines stretch across the sides for an elegant, yet muscular appearance. Front fog lights, power side mirrors, and a dual-pipe exhaust system come standard. Available features include a panoramic moonroof, heated side mirrors with turn signal indicators, a rear spoiler, a blacked-out rear diffuser, sport-tuned suspension, and 19-inch aluminum wheels. Under the hood, the Maxima is powered by a standard 300-hp, 3.5-liter V-6 engine mated to a continuously variable automatic transmission (CVT) and front-wheel drive (FWD). Fuel economy for the Maxima is an EPA-estimated 21/30 mpg city/highway. Inside, the Maxima has a premium cloth interior with a sporty, driver-centric cockpit and a 60/40 split-folding rear seat. High-grade leather upholstery with wood accents is also available. The center stack features the standard NissanConnect multimedia system, which includes an 8-inch touchscreen, an integrated navigation system, Bluetooth connectivity for phone and audio, a satellite radio, and Apple CarPlay capability. Other standard features include power front seats, dual-zone automatic climate control, automatic dimming rearview mirror, remote engine start, push-button start, and reading lights for the front and rear seats. Available features include adaptive cruise control, a power tilt/telescoping steering wheel, heated/cooled front seats, a memory seat, and a Bose premium audio system. Standard safety features include a tire pressure monitoring system and a backup camera. Available features include a blindspot monitoring system, rear-cross traffic alert, forward collision warning, automatic emergency braking, surround view monitor, and pedestrian detection. 58 of 60 (96%) consumers said they would recommend this vehicle to a friend.